Windows Home Server is an awesome product. Microsoft have sadly killed it off (pretty much) with version 2 (code-named Vail – or Fail amongst the version 1 users), but I firmly believe Version 1 will rock on for many years to come. Version 1 includes a fantastic and reliable entity called Drive Extender. Essentially for those who don’t know, it allows you to ‘pool’ storage drives into one big virtual pot of disk space without having to worry about drive letters or where a particular network share is. Running out of space? Just throw another drive at it; it’ll figure out the rest! It also has a “poor man’s RAID” option, whereby certain shared folders can be set up with Replication. This ensures that data in those particular folders will be stored on two distinct physical hard drives in the event that one should fail. Clever stuff. 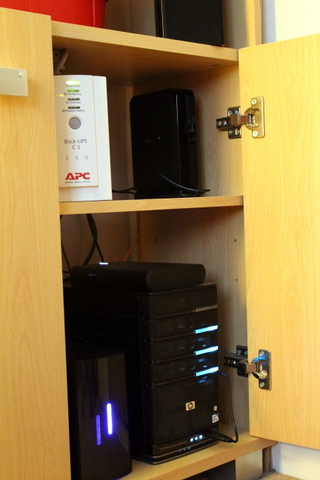 All my data, photographs, videos, DVD rips, downloads, documents, code… basically everything lives on the home server. This is fantastic from a centralised repository point of view. One place to keep absolutely everything, that I can access remotely. With my 50mbit/5mbit cable connection, I can remotely access everything I need without hassle. But it does leave one minor issue. Even with folder replication, that still only technically leaves my data in one place. Ok, so if a hard drive fails it’s not a big deal; data replication will keep things ticking until I replace the failed disk. But what if two drives fail? What if I have a burglary and someone steals the server? Fire? Flood? Disaster. So, a backup strategy was needed. The Home Server itself contains 4 disks (albeit only 3 at the time the external picture was taken). A 1TB system disk that it shipped with, and 3x 2TB disks for expansion. This gives us a real-world capacity of 6.37TB, with currently 3.28TB free. A little room to grow yet! The Backup Strategy Abstract: All folders on the home server are set to Replicate which I use not as a means of backup (for the fire/flood/theft reasons!) but purely as a means of keeping my Home Theatre and digital life going should a hard drive fail. The actual backup strategy lives by the “if data doesn’t exist in 3 places, it doesn’t exist” rule. So, data exists once on the home server. It then gets backed up to the external RAID-1 array (giving me a theoretical 4 copies of the same data) but for the “RAID-Isn’t-A-Backup” amongst us, we shall count that as the second. Except for the DVD Rips, which total up to about 1TB at the moment (before replication), so they get backed up on to the 1.5TB IOMEGA drive that sits on top of the server. The observant will have spotted that while this gives me a theoretical 4 copies, it’s still technically only 2. That’s where the 3TB GoFlex comes in. Every week that drive is brought home from my office, plugged in, and a full backup of everything taken and placed on it. It’s then immediately unplugged, and put in my car for the return trip to the office the next day. The theory being if the house burns down, at least my car might be ok outside! The Backup Strategy Detail: It doesn’t stop there, though. I use KeepVault to also run real-time backups of my Photographic Archive and User Directories. Windows Home Server backups are fine, but they are not real time. Example: I once copied a load of data to my user directory, then accidentally deleted it after deleting the original. If it wasn’t for KeepVault keeping a real-time backup copy, I’d have been screwed. But I just clicked Restore, found what I wanted, and it brought it back immediately. KeepVault also copies it off-site into The Cloud for me as another safety measure! So far I have about 30gb of selective stuff synced into The Cloud with KeepVault. And as a final resort, I use Cloudberry Backup to copy my Photographic Archive share (again!) not just off-site into The Cloud, but onto a different continent (South East Asia, to be precise!) using Amazon S3. It also does the same with very selective parts of my User Directory, mainly critical stuff I cannot afford in any way shape or form to lose, such as security certificates for remote server logins, source code, that sort of thing). So my most critical data is actually protected 8 or 9 times, and all mostly automatically. Even if you discount the replication and external RAID backups that WHS does and KeepVault writes to, everything is in at least 3 places, the most critical between 4 and 5. Most importantly, everything is kept in at least one off-site backup – even the DVD rips – and the most important stuff not only locally in real time, and in a physical off-site drive I own, but into two separate Clouds on different continents as well. Paranoid? When it comes to my data, and the memories in my photographs… you bet I’m paranoid. You can’t afford not to be!